Sitting in the Waters’ John Dalton Suite in Wilmslow, England two weeks ago felt somewhat duplicitous. Here we were, in the part of the world considered the birthplace of Mass Spectrometry (MS), about to embark on a two-day workshop with 20 key collaborators and thought leaders to discuss Ion Mobility Spectroscopy (IMS), its use in contemporary structural characterization, and the promise that the technology holds for the future. Of course, John Dalton FRS, the founder of modern atomic theory, wouldn’t have been too displeased… IMS and MS are technologies being used in conjunction with each other, and IMS lies at the core of Waters’ High Definition Mass Spec (HDMS) instruments. Ok, we were in the right place. Brian Smith, VP of Waters’ MS Business Operations, kicked off the workshop by acknowledging both the challenges and excitement that the IMS community faces in pushing the boundaries of what’s possible, particularly as the technique moves from the province of the expert into everyday workflows at the bench. Dr. Russell Mortishire-Smith, Senior Consultant Scientist for Waters, moderated the program, weaving in thought-provoking questions around the applicability of IMS techniques to routine workflows, the feasibility of integrating molecular modeling into IMS-MS and how a molecule’s Collisional Cross Section (CCS), a matrix and chromatography independent measurement, can be leveraged as an independent descriptor for molecules of interest. An illustrious panel of scientists representing both academia and industry interacted and exchanged ideas with Waters’ R&D and application scientists, presenting examples of IMS’s utility across a wide range of both screening and quantitative applications, from Pharmaceutical to Food Testing. 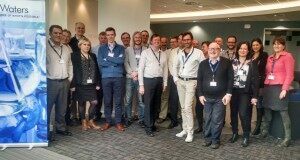 As the meeting neared its end, energies were high – the area of de novo CCS prediction, in particular, is maturing very fast, and has the potential to open up a wide range of applications. Consensus was reached that there was a clear need to standardize the way CCS is approached, in terms of analytical measurement and reporting as well. It was also agreed that the community needs to come together and outline the path forward in order to achieve the goal of making IMS more accessible to the broader scientific population. No small task, but a challenge worthy of pursuing. Waters will be hosting a breakfast seminar at ASMS in St. Louis, MI, featuring Cris Lapthorn from the University of Greenwich who will be presenting on “The transformation of ion mobility and CCS technology into a core decision making tool.” The event will take place on Monday, June 1st from 7 – 8:00am.